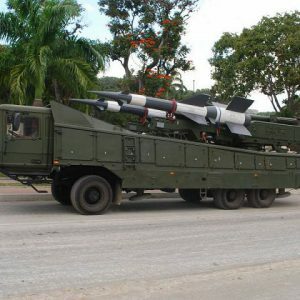 Last month, Venezuelan president Nicolás Maduro promised his people that very soon Venezuela would possess the most powerful air defence system possible, capable of stopping any attempt at illegal entrances into the country’s air space. For years, Belarusian specialists were working on the construction of this facility. The statement by the Venezuelan head of state means that the Belarusian side managed to sort out this serious crisis which the Belarusian military industry encountered abroad just a year ago. Back then, a light airplane of a Swedish PR-agency illegally entered Belarusian air space. Allegedly, it did so to promote democracy by symbolically bombarding Belarus with teddy-bears. But as the leading Belarusian military expert Alexandr Alesin recently noted on naviny.by, it might just as well have served to discredit Belarus’ military capabilities and defence industry. Recent news show, however, that this has not happened. The national defence industry has achieved some success over the last decade by specialising in the modernisation of equipment and the development of its own new systems along Soviet technological lines. Especially impressive are its innovations in air defence – no wonder, Belarus has maintained from Soviet times probably the most comprehensive air defence system among all the former Soviet states. In recent years, Belarus achieved some qualitative breakthroughs by developing new systems and extending its own arms exports – which are not leftovers from Soviet times – and defence products. For example, Belarusians received contracts for the modernisation of the air defence in Azerbaijan and apparently sold some of their products to Iran (though Minsk has not admitted as much). Yet the most lucrative contract was, of course, its Venezuelan one. While visiting Caracas in December 2007 Aleksandr Lukashenka signed with the then president Hugo Chavez of Venezuela an agreement on the construction of a unified air defence system and radio-electronic warfare system in Venezuela. Belarus had to coordinate the project, while cooperating with Russian, Chinese and Iranian companies. Afterwards, Belarus sent numerous military advisors to Venezuela who had to ensure the complete creation of the air defence system in six years time. It went well up until the Swedish incident of last summer. After the incident, Hugo Chavez allegedly thought twice about the reliability of his Belarusian partners. To reassure him, Belarus sent its leading air defence expert Aleh Paferau to serve as ambassador to Venezuela. He was a perfect figure for that assignment, being the former Belarusian air force and air defence commander. In addition Paferau, while serving as a deputy chairman of the State Military Industrial Committee of Belarus actually participated in the conclusion of the “contract of the century” with Venezuela. And he succeeded. By autumn, the Venezuelan air defence and electronic warfare systems shall be essentially completed, says both Venezuelan and Belarusian officials. Of course, another accident also vindicated Belarusian defence industry after its “Swedish failure.” In February, Iranian TV broadcasted a film about intercection of a US drone which entered Iranian air space in December 2011. The film demonstrated how Iran deployed Belarusian-made Vostok-E system to intercept the American remotely piloted vehicle. It had an effect and although the US immediately sanctioned two Belarusian enterprises, Minsk could demonstrate some tangible and battle-proven achievements to its foreign friends. In May, as the Vietnamese prime minister visited Minsk, Belarusian officials claimed to have achieved an agreement with Hanoi on selling Belarusian unmanned aerial vehicles to Vietnam. A month ago, Belarus agreed to sell about 20 Vostok-E radar systems to Vietnam, as well as send advisers to train Vietnamese operators for them. But Belarus is still rather limited in its weapons business abroad. Any big deal requires the involvement of Russia. Sophisticated Belarusian military products require components produced in Russia or other post-Soviet republics. And it this dependence on Russia that has increased in the last decade as Minsk has exhausted its stocks of Soviet-era equipment or, often, this equipment simply became obsolete. Now Belarusians are producing the equipment themselves, but their dependence hampers their growth in this field. The creation of the Venezuelan air defence system illustrates this complementary feature of Belarusian defence industry. Thus, as the command center of the system, Belarus chose its native automated fire control station Bor-1M. In addition, Minsk provides Venezuela with radar equipment and radio-electronic combat systems of its own production. Among them, of course, the above-mentioned Vostok-E developed by the firm KB Radar in Minsk. But that is essentially all, for the remaining components of the Venezuelan air defence system Belarus has to resort to Russian weapons. As for surface-to-air missiles, most likely the S-125 Pechora-2M on chassis from the Minsk Wheel Tractor Plant (MZKT) will be used in Venezuela, after their modernisation at select Belarusian and Russian factories. Some other important components of the Pechoras are also being developed and produced by Belarusian firms, yet essentially the Pechora is a Russian product. In addition, Venezuela ordered from Russia some items of more modern systems such as the S-300 and Buk-M2E. Once more, Minsk cannot provide such arms itself independently, although the Buk launchers are also installed on Belarusian MZKT chassis. Caracas had also to complement these purchases by buying from Russia some Zu-23s cannons and Igla-S man-portable surface-to-air missiles. Is Russia Ready to Recognise Belarus as an Ally? Evidently, Belarus has to cooperate with Russia on big arms and defence modernisation deals. There is nothing particularly extraordinary about this, as allied states usually cooperate with regards to their defence industries. Yet Russian policies towards defence cooperation with Belarus look more like a desire to grab the most efficient Belarusian firms in its defence industry than cooperate with them. The best example is the same MZKT which produces chassis of world-renown quality. The Kremlin some years ago launched a policy of replacing all the components of Russian weapons produced in former Soviet republics with Russian-made ones. Since at least the early 2010s, it made no exception to this rule even for for its closest ally – Belarus. The Russian military decided to replace Belarusian chassis of the Russian missile systems with their Russian equivalents which were not even available at the time when the decision was made. It further led Russia to the idea of buying the MZKT – one of the best Belarusian firms. Moscow has many means to pressure Minsk with its financial troubles into selling the works. This would both undermine the future prospects of Belarusian economic development and will further diminish the importance of Belarus to Russia. It is precisely these kinds of situations that show Belarusian officials and businessmen the risks of cooperating with Russia. The Russian side apparently is not eager to do business together with Belarusians, but rather it wants to take their business from them. Moscow simply refuses to accept Belarus as a partner despite its geopolitical significance and strategic proximity and commitments of Belarus concerning its alliance with Russia. The Belarusian opposition and Western politicians should avoid demonising the Belarusian defence industry and military. It would be wiser to provide them with realistic prospects with a positive future – an alternative to being strangled by Russia. The demonisation of the defence industries and military by reformist forces in the former Soviet republics in 1990s – especially in Russia and Ukraine – brought no good and led to backlash with grave political consequences. The Belarusian statistics agency has recently published the average salaries by region in June. Minsk city appeared as the leader with an average salary of $750. In second place was the Minsk region with an average of $580, and in Salihorsk it even reached as high as $840, higher than in the capital’s average. Salihorsk is a city located south of Minsk, where the whole economy is built around a highly profitable potassium trade. The Minsk region is home to many industrial areas. The region, of course, has close relations with its centre, Minsk city, which absorbs both human and financial resources from its periphery. This kind of centralisation of the economy can indeed have negative consequences for the region. The Minsk region remains divided in terms of its political orientation and attitude towards the Belarusian language. The western part shows more support for the democratic opposition and uses the Belarusian language. The east appears more pro-regime and less Belarusian-speaking. Generally speaking, no political activity exists here beyond the state. Typically for Belarus, the Minsk region was a home for its world renowned Jewish emigrants. Some of America’s brightest media figures, such as Larry King, Louis Mayer and David Sarnoff have their roots here. The life of the Minsk region is determined to a great extent by its centre, Minsk city, which has more population than any of the other regions in Belarus (over 1.8 million people). As is true with many big cities in the world, Minsk draws commuters from nearby towns who can earn two or three times more there. However, this movement is not as massive as, for instance, in Moscow, and typically no major traffic jams occur here. The Minsk region, however, is more than a periphery of the capital. The region has a few other big cities in which a considerable amount of the country’s economic resources are concentrated. Among them are Maladečna, Barysaŭ, Salihorsk and Žodzina, all of them big centres of industry. The young Belarusian city of Salihorsk emerged with the establishment of its potassium extracting enterprise, Belaruskali. It alone is responsible around 10% of Belarusian export annually and presents perhaps the most profitable state company. Now that the Uralkali has halted its cooperation with Belarusian Potassium Company, the market prices are expected to go down and Belarusian export risk facing significant losses as a result. Such developments will necessitate a search of the other sources of income which Lukashenka is apparently trying to find in China. Žodzina city is known for another Belarusian industrial brand, BelAZ, the largest manufacturer of haulage and earthmoving equipment. Its dump lorry, also called Belaz, has become a symbol of Belarusian industry. Barysaŭ city, although also an industrial centre, is more famous for its BATE football team. BATE has proven to be the strongest team in Belarus for some time now and was the only team in Belarusian history to qualify for the group stage of the UEFA Champions league and UEFA Europa League. “the Sluck Rebellion.” Two armed regiments declared support for the unrecognised Belarusian Popular Republic and resisted red army assaults for nearly a month, though eventually they eventually succumbed to the Bolsheviks. The Minsk region historically appears as a region divided: the western part once belonged to the Polish Republic and the east to the BSSR. The Western part, and especially the northwest which borders the Vilnius region, showed the highest level of support for the democratic opposition during the presidential elections. This mapping is also true for the persistance of the Belarusian language, as many western parts of Minsk region speak Belarusian, more so than in its eastern parts. Generally, the region has the largest overall population that speaks Belarusian at home. Today, political activity not affiliated with the state has almost disappeared in the region. No independent local newspapers exist and once glorious regional organisations like Salihorsk Malady Front have stopped all their activity. The most recent protests in the region were related to the government’s plans to build a Chinese industrial park in the Smaliavičy district not far from Minsk, but hardly anything can prevent the regime’s idee fixe. The governor of the region, Barys Batura, for his part, appears to be someone that the president can count on. As with all of Belarus’ governors, he constantly has to travel around the region and ensure that every fence on the road is fixed and every field harvested. Batura descends from the Hrodna region and served in the state bureaucracy since the Soviet era. He worked in the housing and communal services ministry, and then was appointed the governor of Mahilioŭ region in 2000 and governor of Minsk region in 2010. Like many officials in Belarus, he has not produced any extraordinary activity and quietly executes orders from above. As Belarus in general, the Minsk region served a homeland to many Jewish emigrants who later gained world prominence and recognition. Among them is Larry King (born Lawrence Harvey Zeiger), a famous american television and radio host. He is the son of Edward Zeiger, an immigrant from Austria, and Jenny Gitlitz, an immigrant from Belarus. King became perhaps the world’s most well-known face on TV, but few Belarusians realise his ancestors lived somewhere around Minsk. Louis Burt Mayer, an american film producer known for successful running of Metro-Goldwyn-Mayer company, was born in Minsk in 1884 as Lazar Meir. His family moved to Rhode Island in 1887. Subsequently Mayer made a career in the entertainment business and headed one of the most famous film companies in American history. David Sarnoff, born in 1891 in Uzliany village in Minsk region, was an American businessman and a founder of both radio and television broadcasting. His family moved to New York City in 1900, where he made a career in telecommunications, leading the Radio Corporation of America and National Broadcasting Company (NBC), two american telecommunication empires. Moving from the US to Europe, we find other famous descendants of Minsk region. Chaim Soutine, was born in Smilavičy settlement in 1893. After studying art in Russian Empire, he emigrated to France and significantly contributed to the French expressionism movement. Interestingly, in 2012 a Belarusian bank Belgazprambank, owned by Russian gas empire Gazprom, bought one of his paintings at a Christie’s auction for $400,000 together with a Marc Chagall piece. The bank is sponsor the return of works of artists of Belarusian origin, since none of their works have remained in Belarus. For the time being, the Minsk region will have to go on without, much as it has, these fine people. In their place, remain the many challenges and issues to be overcome. The region draws more investment due to its central location and therefore is likely to remain the core of the Belarusian economy. However, its central location puts it at risk of being overshadowed by the capital, Minsk city, which absorbs most of its human resources and drains the potential for local development. The over-centralisation of Belarus presents a serious challenge for the Belarusian government.